Just stand by the exit doors of where you work and watch people’s faces light up when they leave work. Why is that? Because now that work is over, they get to go do what they really love to do. Great leaders change that. Great leaders Connect People To what they really want to do while they are still at work. In my last article, How Great Leaders Connect, I explained the importance of Connecting With People. Connecting With People simply means the ability to reach people’s hearts as well as their minds. We don’t pledge our greatest passion to a good business plan; we put forth our greatest effort and energy to leaders who are passionate about their business. People will reach pretty deep and “give it their all” when they feel really connected with a great leader. The way we Connect With People is on a human level, using our emotions. Check out the full article to learn the two steps to Connecting With People. But Connecting With People is only half of the solution to be a great leader; The other half is Connecting To. Connecting To simply means drawing the shortest line between someone’s personal goals and the mission of the organization. When people feel your organization is a great place to realize or live out their best talents, passions and ambitions, they do great work to benefit the organization. Some people call it getting people in the right seat on the bus. That’s what we learned in the book, Good to Great by Jim Collins. That’s important, but I think Connecting To requires more than having people work in their specific area of strength. It is about finding ways that people can do what they are passionate about, what they care deeply about and what they love to do. Of course, it must also be something worthy that contributes to what the company needs. Good leaders connect people’s passions with the goals of the organization. For me, it was public speaking. One of my past supervisors knew that I loved public speaking and that was what I really wanted to do. Even though I was an operations guy, he frequently gave me the opportunity to give speeches inside and outside of our company. I was not the official company spokesperson, so why did he have me doing that? Because that’s how he connected me to the mission of the organization. My face would light up while I was still at work. He was a great leader because he could see what people really wanted to do, and he used that to Connect People To the greater mission of the organization. For others it might be design work, community service or R&D. Those are all functions and worthy tasks that a company needs done. Connecting With People and then Connecting People To the organization are central to the action plan of being a great, emotionally present leader. Emotions matter greatly in leadership because when we Connect With individuals on an emotional level, we discover what propels them to action and marshals their resolve. Once we know what motivates people, we can then Connect People To the organization in a meaningful way. Great Leaders discover what people really want for themselves and use that to Connect People To the organization. Be an Emotionally Present Leader! What Gifts Are You Giving This Year? Are you losing the war on time? 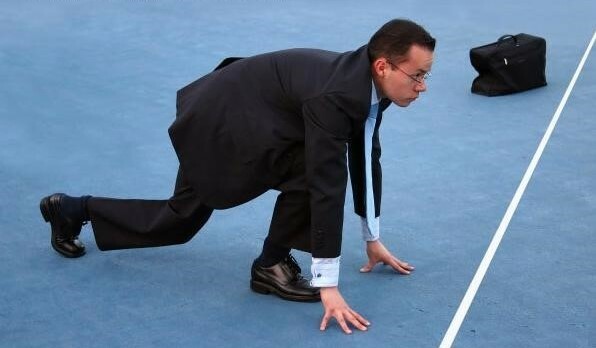 It’s time to win back the three most essential qualities of leadership. 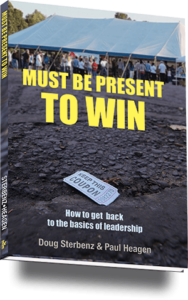 The new book by Leadership speaker Doug Sterbenz and Executive coach Paul Heagen.